pickles, such as avakaya, a pickle made from green mango. Dosa Avakai is an old Andhra culinary tradition which can be prepared easily. Cucumber (Dosakaya) - 500 gms approx. 1.Wash cucumber and wipe with a clean kitchen towel and dry for some time. 2.There should not be any moisture on the cucumber. 4.Now take the cucumber pieces in a mixing bowl add red chilli powder, salt, mustard powder and methi powder ,mix well with a ladle. 5.Add 100gms of oil to the cucumber mixture and mix well. 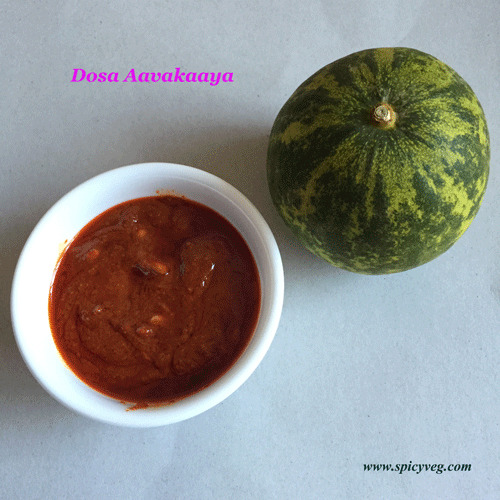 6.Rest the Aavakai at room temperature in a dry place for 6-8 hours to absorb the spices. 7.Store it in a air tight container or jar. 8.The cucumber absorbs the spices and is ready to eat with rice and ghee. Note:Tastes good for 2 to 3 weeks if refrigerated.